Before Washington became a state in 1889, territorial land claims recorded many names which are not now well-known. Who were these early-arriving settlers? The map of what is now the Wedgwood and Meadowbrook neighborhoods of northeast Seattle is dotted with land claims in the name of Marshall Blinn. Who was he? Students of Seattle history recognize names of major figures such as Arthur Denny, leader of the Denny Party of white settlers who arrived in 1851 and who are considered the founders of the city. But there were many other contributors to early Seattle whose names have been forgotten. On the basis of the number of land claims of Marshall Blinn, he would seem to have been an important figure, but we will find that though his influence touched Seattle, he never actually lived in Seattle. In this article I will tell about logging and land-grabbing in Washington Territory before statehood, and I will speculate on how northeast Seattle might have developed differently if Marshall Blinn, an early adventurer, had come to live on his land claims. Copyright notice: the text of this article is protected under a Creative Commons Copyright. Do not copy without permission. As a lumberman and ship captain from the state of Maine, Marshall Blinn sailed a ship to San Francisco and explored the economic opportunities following the California Gold Rush of 1849. Rather than taking a chance on finding gold, Blinn saw that there was money to be made as a supplier. Blinn went in together with other Maine lumbermen and formed a company to supply the miners, and the city of San Francisco, with timbers needed for building. Seabeck is on Hood Canal, part of the Puget Sound waterways west of Seattle. In 1856 Blinn, age 28, and his bride Julia moved out to live in Washington Territory for the rest of their lives. Washington had been made separate from Oregon just three years before, and very few white settlers lived north of the Columbia River. Together with other lumber speculators the Blinns founded the sawmill town of Seabeck on Hood Canal (on Puget Sound, west of Seattle across the Kitsap Peninsula.) In those early days it was said that settlements around Puget Sound were mere suburbs of San Francisco, because nearly all of the lumber that could be produced by Seabeck, Seattle and other logging and sawmill communities was put aboard ships to California. Though he was a resident at Seabeck in the 1850s and 1860s, Marshall Blinn became well-known in Seattle through visits on the ship he piloted, the Brontes. Blinn had been sailing up and down the West Coast searching for a place to set up a timber operation along with his co-investors. Other “men from Maine” were doing the same, including Pope & Talbot who set up at Port Gamble. 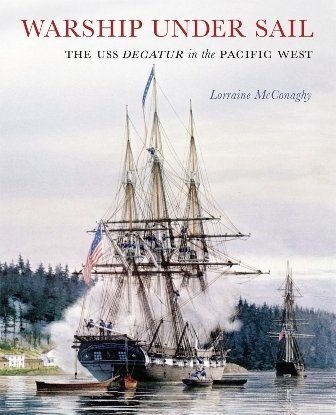 Seattle historian Dr. Lorraine McConaghy wrote this book about the USS Decatur, the ship that saved Seattle. Though he is not mentioned by name, it is possible that Marshall Blinn was at the helm of the Brontes which was anchored in Elliott Bay on January 26, 1856, during the Battle of Seattle. Seattle’s white settlers took refuge in a blockhouse at First & Cherry Streets while under fire from Indian attackers hidden above the tree line, which was then at Third Avenue. The Puget Sound Indian War had begun in October 1855 at other settlements, including the White River valley (Auburn). Seattle settlers made ready by constructing a blockhouse and asking for military protection. A warship, the U.S.S. Decatur, was anchored in Elliott Bay and ready to defend the Seattle settlement on that day in January 1856. Arthur Denny wrote that “It is a mere matter of opinion whether the town without the aid of the Decatur would have been able to withstand the attack; but with the help of the marines on shore and the guns of the Decatur in the harbor it was quite a different matter.” (page 76, Pioneer Days on Puget Sound.) It was also recorded that anyone who wanted to leave town, was evacuated on the Brontes. Toward the end of the 1860s Marshall Blinn may have foreseen the coming decline of the lumber business due to having depleted the supply of trees, and the general decline in economic conditions. Blinn had turned 40 years old and he left the Seabeck sawmill business in the hands of his brother, while he went on to other pursuits and investments. Blinn intended to run for political office so it was fortuitous when he just happened to meet a major national political figure, William H. Seward, in Victoria, British Columbia, on July 20, 1869. Blinn invited former Secretary of State Seward to take a quick tour around ports of call on Puget Sound, chartering the steamer Wilson G. Hunt for the trip. 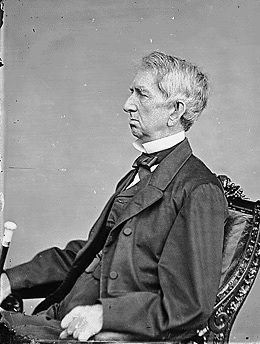 Blinn calculated that the people of Puget Sound communities would be very happy to meet William H. Seward in-person for the first time, and Blinn was right. When Seward was a U.S. Congressman from New York in the 1850s he first began the campaign to purchase Alaska from Russia. 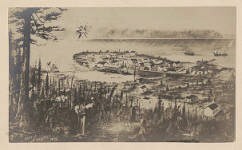 At that time the Washington Territorial delegation to Congress had presented a recommendation to acquire Alaska with all its rich resources of timber, fishing and mining. Long years, including the Civil War, intervened but finally in 1867 Seward, who by that time was Secretary of State, completed the transaction. 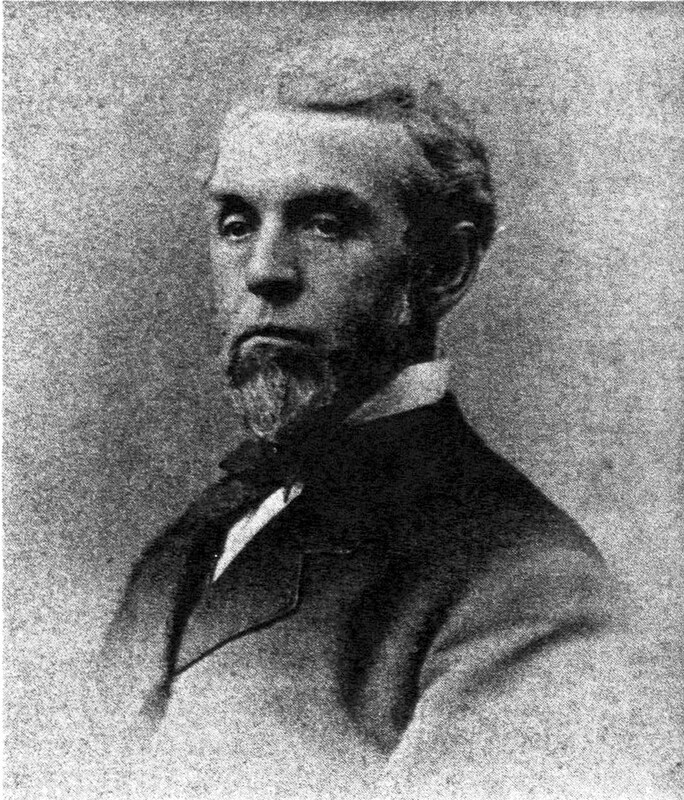 After retirement in 1869 William Seward purposed to go and see Alaska for himself and on the way, Marshall Blinn intercepted him at Victoria and took him on a tour of several pioneer settlements such as Seattle. The people of Seattle and other communities were glad to shake Seward’s hand and thank him for the investment in Alaska which did enhance the economy of the Pacific Northwest. Marshall Blinn probably thought he would gain political goodwill for himself when it became known that he had conducted Seward around the Sound. Blinn’s political aspirations did not work out and neither did any of his other ventures and investments in the 1870s, including mining and cattle-raising in eastern Washington. He did bring a great deal of enjoyment to Seattle in what was called “the summer of ice cream” in 1872 when he brought a shipment of ice from the Sierra Nevada Mountains. With ice it was possible to make ice cream and serve chilled beer and soda. In Seattle an ice house was constructed on Yesler Wharf at the waterfront and a good time was had until the ice shipment ran out. Apparently the business venture was not profitable, and Blinn’s Puget Sound Ice Company ceased operations in 1873. By the 1870s the lumber mills along Hood Canal were becoming victims of their own success as the stands of available nearby timber were nearly logged out. The census of 1870 showed that the Blinn family had become residents of Olympia, with Blinn’s occupation listed as “retired lumber merchant.” Economic conditions also began to affect Seabeck when, in 1873, Tacoma was chosen as the terminus of the Northern Pacific Railroad. Prior to that time Blinn and other logging speculators had lobbied for a railroad up through the Olympic Peninsula to Hood Canal to help take out the timber. Marshall Blinn hedged his bets by getting out of Seabeck early and by investing in land all around Washington Territory where potential rail lines might run. In the 1870s Blinn’s land claims across Washington Territory numbered more than forty, from the timber stands of the Olympic Peninsula to Okanogan County in eastern Washington where Blinn was one of the co-investors of the Eagle Mining Company. Arthur Denny wrote, “I came to the Coast impressed with the belief that a railroad would be built across the continent to some point on the northern coast within the next fifteen or twenty years, and I located on the Sound with that expectation.” (page 15, Pioneer Days on Puget Sound.) Like Denny, Marshall Blinn took out land claims where he might gain income from logging, and in hope that his cleared land would become the route of a railroad, which would greatly increase the value of the land. 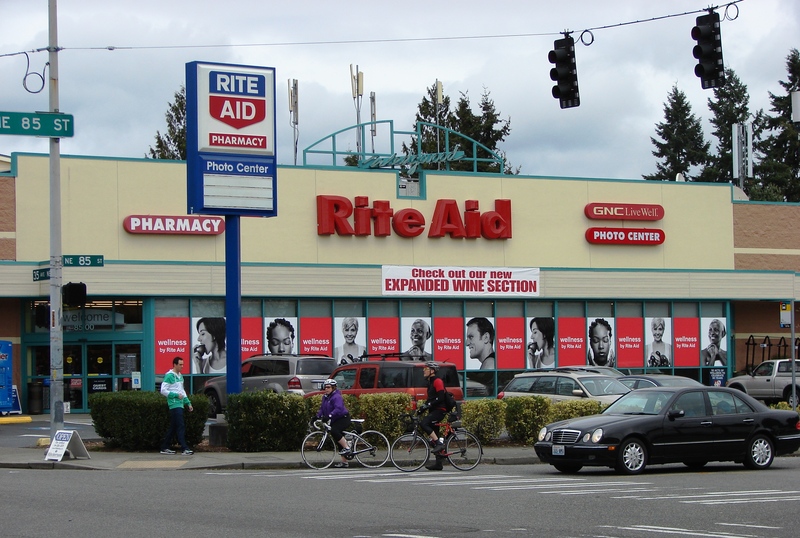 One of Marshall Blinn’s land claims in 1870 was the present site of Rite Aid at NE 85th Street in Wedgwood. We can speculate that the hope of railroad development was the reason for Blinn’s land investments in what is now the Wedgwood and Meadowbrook neighborhoods of northeast Seattle. The map shown below, created in 1889 to show all land claims prior to statehood, has NE 85th Street as the bottom line, and the first vertical line on the right is 35th Ave NE. We see the name of Marshall Blinn written along 35th Ave NE from the present site of Rite Aid at NE 85th Street, up to NE 100th Street, as well as many other places farther to the north. Next to Marshall Blinn’s name is written the land claim certificate numbers and the dates recorded in the early 1870s. We do not know whether Blinn ever logged timber on these sites but he likely continued to hold the land claims as an investment. In those days land holdings served as a kind of life insurance policy for the inheritors of an estate to be able to sell for income. Marshall Blinn did not live to see any of his north Seattle land investments become valuable. He died in 1885 at age 58, without seeing a transcontinental railroad connection come to Seattle. By that year, north-south travel by train still ended at Tacoma and it was necessary to take a boat from there to Seattle. Even when the locally-built Seattle, Lake Shore & Eastern Railroad began bringing coal from Squak (Issaquah) to downtown Seattle in April 1888, the railroad line did not pass over any of Marshall Blinn’s investment lands in the future Wedgwood neighborhood. Instead, the train followed the shoreline of Lake Washington, along the course of today’s Burke-Gilman Trail. Township 26, Seattle north of 85th Street, map recording land claims prior to 1889. Map courtesy of the Seattle Room, Seattle Public Library. At the lower right corner is written the name of Marshall Blinn on the present site of Rite Aid in Wedgwood, along 35th Ave NE at NE 85th Street. The small lake at left/middle is Haller Lake at 125th & Meridian Ave N. The black square marks the land claim of John Thornton, namesake of Thornton Creek. The name of Marshall Blinn can be seen in many places on this map. An 1895 view of ships loading lumber at Port Gamble’s mills. Photo 4960 of UW Special Collections. Arthur Denny’s account of cutting down trees by hand in 1851 tells that the men felled the trees over a cliff and rolled them into the waters of Puget Sound. They had no other way to transport the logs except to float them, and then the logs would be winched up into the hold of a ship or rafted and towed to a sawmill. Similarly, sawmill towns such as Port Gamble and Marshall Blinn’s Seabeck were also located on waterfronts where cut lumber could be loaded onto ships bound for San Francisco. All of the Seattle area’s earliest-developing communities were on waterfronts, and the lack of water access for transportation is one of the main reasons why inland northeast Seattle, including the future Wedgwood, remained unpopulated until after 1900. There were trees in northeast Seattle but a lot of effort would have been required to log the trees and haul them out, so the area remained largely untouched. We can speculate on what the Wedgwood neighborhood would have become if, as he had done at Seabeck, Blinn had established residence and built up northeast Seattle with sawmills, hotels, business establishments, schools and churches. Perhaps Wedgwood would have been named Blinnsville. Instead, Wedgwood was a slow-to-develop area which was very rural until after the end of World War Two in 1945. Albert Balch became the developer of Wedgwood who created large areas of housing and who, in the 1940s, set aside land at the intersection of 35th Ave NE and NE 85th Street for commercial development, on tracts which had been owned by Marshall Blinn in the 1870s. Albert Balch, the developer of the Wedgwood neighborhood, was not from Maine, but it is interesting to note that one of Albert Balch’s ancestors, his great-uncle Lafayette Balch, was a “man from Maine” like Marshall Blinn. Lafayette Balch had also sailed his own ship from Maine out to the Pacific Northwest in search of a site for lumbering. In 1851 he established the town of Steilacoom with a sawmill, cargo vessels and a San Francisco sales yard. 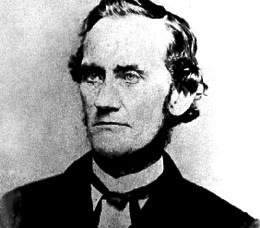 He had encountered Marshall Blinn in San Francisco in the 1850s and it is very likely that his success influenced Blinn’s destiny of harvesting timber in the Pacific Northwest. What happened next: The land section from the corner of NE 85th Street (Rite Aid in Wedgwood) up to NE 95th Street was later acquired by a man who intended to develop the area. In 1890 Joseph Doheney filed a plat, meaning that he gave the land section a name (Pontiac) and had streets laid out (on paper only) so that he could sell lots in the plat. Four Wagons West: The Story of Seattle by Roberta Frye Watt, 1931. The author was a granddaughter of Arthur Denny. Seattle Public Library, 979.7772. Kitsap: A Centennial History, Fredi Perry, editor, 1993. Seattle Public Library 979.776. Pioneer Days on Puget Sound by Arthur A. Denny, 1887; 1979 edition with introduction. Seattle Public Library, 979.7. Seabeck and the Surrounding Area, by Fred Just, 2016. Seattle Public Library 979.776. Seward’s Folly by Melissa Whitcraft, 2002. Seattle Public Library 979.8. This Battle of Seattle painting can by found in the Seattle Public Library collection of historic photos. The painting was done by Emily Inez Denny as part of her recollections of the Battle of Seattle. The bark Brontes and the warship USS Decatur are shown in the bay. Warship Under Sail: The USS Decatur by Lorraine McConaghy, 2009. Seattle Public Library, 359.322. Washington Territory by Robert E. Ficken, 2002. Seattle Public Library 979.703. #5406 U.S. Senate ratifies purchase of Alaska from Russia on April 9, 1867. #9969 William Seward visits Puget Sound on July 21 and 22, 1869. #191 Ice is sold in Seattle for the first time on May 13, 1872. #1604 Ice cream is an immediate hit on May 18, 1872. #8195 Statue of William H. Seward is unveiled at the Alaska-Yukon-Pacific Exposition on September 10, 1909. This entry was posted in Land records and surveys and tagged founders of Seattle, Kitsap County, logging, Neighborhood History, Seattle, Township 26 in north Seattle, WPLongform. Bookmark the permalink. Maybe he claimed the Rite Aid because he knew they would have an expanded wine section. Oops, here’s one fact I omitted about Marshall Blinn: he was an absolute teetotaler and he tried to keep Seabeck a dry town. That didn’t go well. But Blinn would be glad to know that today, Seabeck is the site of a Christian camp and conference center. Whether or not you agree with Blinn’s religious or political leanings, no one ever disputed Marshall Blinn’s character, industry and honesty. He was an amazing, bold pioneer of Washington Territory.